Looking around for a used Chevrolet Suburban in Atlanta GA? We have used Chevy Suburban, look for dealership prices and specials. The Suburban is a stylish large SUV that is perfect for families due to its spacious interior and large cargo space. The Suburban was first introduced to the market in 1934. The exterior is rugged while the interior offers a large number of amenities. One of this SUV’s most noted features is its towing capacity. Third row seats are generally adjustable and can be folded down for additional cargo space. Used SUV’s may be good choice if you want a large car without paying the hefty price. Financing options are available. 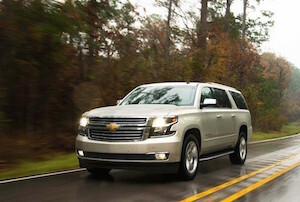 Visit our dealership and test drive a used Chevrolet Suburban Atlanta GA.